A teaching assistant who told a 12-year-old pupil he loved her has been suspended from working. Dafydd Sion Lloyd, 25, admitted unprofessional conduct but denied he was trying to achieve sexual gratification. 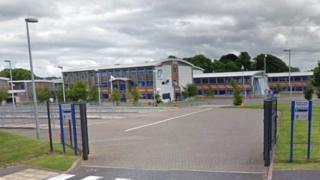 The incident happened at Queen Elizabeth High School, Carmarthen, in March 2016. While he had resigned, a Cardiff disciplinary panel suspended him from teaching for a year. He approached the schoolgirl and told her "I've got to get something off my chest", the Education Workforce Council hearing was told. Case presenter Sarah Lewis told the panel he then said: "I want to talk to you about the 'L' word, do you know what it is?'" When she asked: "Do you mean love? ", he replied: "Yes, I have got to tell you that I love you; do you have the same feelings for me?" Ms Lewis said the girl had expressed shock, saying she had no feelings for him and despite being urged to keep quiet, had told her parents and the head teacher. Mr Lloyd told the hearing his need to tell the girl how he felt was a "compulsion". While he resigned from his job four months after the incident, he was suspended from teaching for 12 months. The disciplinary committee ruled they were not satisfied his conduct was for the purpose of achieving sexual gratification. He can return to teaching if he is given a fitness to practise psychiatric report. Committee chairman Gareth Roberts said: "Mr Lloyd failed to maintain an appropriate professional boundary with Pupil A, failed to have regard for her well-being and undermined public trust and confidence in the education workforce."